Some of you may know my wife and I have helped her parents out for almost 20 years. When her mom passed last year her brother who was never around to help finally showed up wanting to know when the estate was going to be split before she was buried. We had been the ones to take care of her and my wife was the executor at that time. Anyway her brother took half her parents money out of the bank and then proceeds to take her to court trying to take over even though he never did anything much for them. We were going to try to make a fair offer on the land and buy him out but after this I told my wife we need to focus on what she wanted mainly which was the land around us and her dads tractor. So in the meantime we paid her moms burial and hospital bills out of my wife's part of the money. The court took the executor position off my wife and put it on a 3rd party which worked out good. We no longer had to deal with her brother and his attitude. Since her brother took his part and my wife took her part out to pay bills there was no money to run the estate. We were able to work out a deal that we bought the 3 acres around us, buy her dads tractor, and buy all the junk in the barn so no one would get hurt going through there and tying up the estate. She was allowed to buy the items for the remainder of what she got from her share of the money her mom had and will also be reimbursed the amount she paid for the funeral expenses once her moms house and land that is left is sold. This will make it split down the middle again for them. 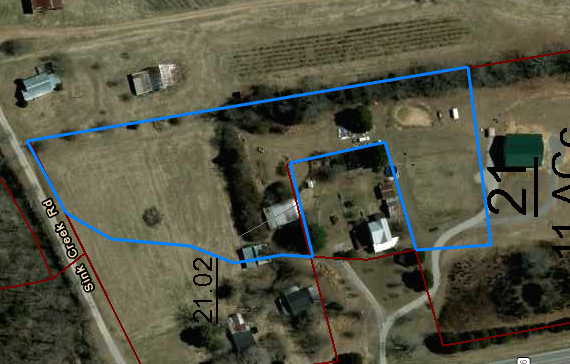 Here is a picture of the land we got. The area in blue is the new part. Our house is the area in the square that it surrounds. In the picture you see where the road splits going to her moms house on the right. This is roughly about 80 foot from our door and is the edge of the area where the new road will be. They cut back on the project and will only be widening the road and not put in 4 lanes. This would be the edge even if there was 4 lanes. With that said at this point we own the items she wanted and I have been cleaning since the fall on the place. Her brother we think went out and spent all the money. He bought a 4 door diesel dually with everything. We figure he put a down payment and he told her he has payments. He was expecting a big payout and I am guessing from his statements he expected to get more just for himself than the entire estate was worth. Anyway since the fall I cleaned up the original property line to put a new fence up. I also cleaned around the barn good as well. I had not been able to keep it clean as there was more property to deal with than I had time doing that, working full time, doing side jobs and taking care of my wifes mom. Now since we no longer have so much to deal with I have made a huge progress on the place. I have somewhere between 1/3 to 1/2 of the wooden fence posts up. I also have cleaned out almost a complete section of the barn. This will be a storage area of the stuff we don't want to keep and plan to sale in a yard sale. I also put up a door in this area. I probably have hauled off at least 30 to 40 truck loads of brush to a burning pile I have. I may have to let it rot some as it is so big now. I have a link to a lot of pictures if you get bored and want to see the work I have done and all the junk I got to get rid of now. One of the pictures is of a green vinyl house, this was the mother in llaws and it is roughly about 40 feet from our new property line. Our house is the blue one and the grayish brown one is the neighbor behind us. I figure we over paid about 5k or more on the land and items but it was worth it to get rid of having to deal with her brother. The good thing is that went back into the estate and basically she will get half back so it is a deal when you think of it that way. We got her dads AC model C tractor and farm implements, 3 acres of land, a decent barn I can fix up and make nice. We also got a few stacks of lumber and quite a few items in the barn we will keep. I have already sold some junk and that will pay for some of the fencing materials. I figure when we sell the items we want gone we should have made enough to pay for enough materials to fence the place doing it myself. When it is all over I expect her brother to get out of the sale of whats left a big chunk of the cost of his truck. The bad thing for him is he is retired and probably be left with holding around 1k a month payment on that truck. When we are done we plan to have her dads old tractor rebuilt, have my international tractor rebuilt, she wants a new refrigerator as ours is on the way out, pour a small patio in the back and put the rest in the bank for a retirement nest egg. Hopefully I can get all this done this summer. The fencing doesn't seem to take as long as I expected and hopefully the barn will work out the same. After all this is done maybe I can finally get on a regular basis of fixing old tube stuff. The good thing about the barn it looks like I will have some decent room to store radio parts as we won't use the entire barn for other stuff. If you want to see Sanford and son ,Tennesse style go to this link below and look at the pictures. Estate "stuff" can be emotionally draining. You must be happy to be almost thru' it. I've been following along (sort of) with some of your photos on Facebook and it looks like you're doing a lot of work! It looks really good all cleaned up. I think the biggest pain on the estate stuff is dealing with relatives. My wife now says he is dead to her and I believe it. Unless a person has been through it when someone does you so bad that they are dead to you a person cannot explain it. I have a relative that I went through them doing me wrong and I see it on her with her brother. I could write a book on how he has been ugly to us in all the time we have been married. But we no longer have to deal with him. I doubt she will ever speak to him again. After their mom had been dead a couple of weeks he told her two weeks was long enough to grieve and they needed to get on with splitting the estate. I told her I never wanted him in our house again or to even see him. She said the same. We put up all those no trespassing signs so we could tell him to leave and then have him arrested if he doesn't. The good thing for us it is basically over other than her receiving any inheritance from the sale of the house and land left. They went to court and he was agreeable for a change. He was ok with having a road directly put to the house and the cost to have it done. So hopefully in the next few days that can be done and I can put a fence up splitting it in half. I plan to dig up the gravel on our side of the property and fix a hole caused by so many coming up there to that house. I told my wife what we could do is buy a few metal posts or other items we need out of our paychecks as we could afford them and hopefully we can get a lot of the fencing done. We got about 25 wood posts so far and I plan to get on Friday one roll of fencing and about 20 metal posts since the income tax rebate was good for us this year. I will put them up this weekend. The way the land is we have about 1/2 acre the house,my original workshop and backyard is on. Then we have a garden about 100x100. This also includes a row of raspberries on each side. Then we have been getting some of these cheap strawberry rings over the last few years and we will have 5 by this weekend, we have another coming this week. We also planted a couple of apple trees,peach trees and a cherry tree years ago as her parents promised this part of the land to us years ago. We also have about 8 grape vines I plan to make a arbor for. I had 4 I transferred to a more open area, I grew two more this winter experimenting with them last fall and then we got two more. I also have some muscadine seeds to plant to start them soon. That will leave us about 2 1/2 acres to have animals on. We currently have chickens so I will make their pen a little larger. The funny thing about all this is he went after her hard to bully her in the beginning. He told her she was getting the gold mine and he was getting the shaft when she said she wanted to try to buy his share out. At that time we wanted to buy it so our daughter could take over the payments so she would have it. After he acted the way he did I told my wife one day when she was so upset this. I said lets let it go. I said our daughter would probably move off and we didn't want to make her feel guilty and stay. I also told her for the most part we had everything paid off and owed very little. I said we would have a house payment and a house we had no use for if our daughter didn't move back to the area after college. I told her if she worked on getting the land around us ,her dads tractor as she didn't want it sold to a stranger and also try to get the junk in the barn that would be good enough. I said we could have a little from the sale of the place to do a few things and then put the rest in savings as we have not been able to save very much for a few years due to helping our parents and our daughter. I use to make some on the side doing repairs but couldn't due to helping everyone else. Since the executor has probably spent as much to go through and sale all the stuff in the house we wanted to buy the junk in the barn. We didn't want anyone in there to get hurt and then tie it up even longer. I also thought we could sale the stuff we didn't want and make some back. So thats what we did and we got what she really wanted, the land,tractor and stuff in the barn. Its funny though how things turned out. If he had been agreeable we would have paid more for the house than it was worth, went in debt for a house that has some issues, and he would have got a lot more money than he will. All he seemed to want was money. Our daughter did graduate and she lives about an hour away in Nashville, we would have a second house we had no use for if we bought it. It also has some structural issues that will need to be addressed down the road. By his actions we got what she really wanted,we are still debt free and now he is the one who will owe a lot on a truck he can never get his money back out of. I guess he was right ,she got the goldmine and he got the shaft. But he give himself the shaft and gave her the goldmine. Willy, I completely understand.......I have a sister who is now dead to me for 4 years. To be honest, my life is much better without all her drama. My only regret; It should have happened sooner! Families can be a blessing or a curse. I had a sister that was similar but not as bad. My mom has always been odd and a few years ago I found out why. She has whats called borderline. Remember the movie mommie dearest? I have never seen the entire movie but from what I understand and have seen of the clips I would say she had it in the movie. Thankfully I don't have it from being checked out, just the symtoms of being taken advantage by someone who has it. My attitude anymore is you treat me good I will treat you good. If you treat me bad I have no room for you in my life. Funny thing is a person can have a abusive spouse and most people are supportive of the victim if they get a divorce. But if you are abused by a relative folks act like you should forgive them and continue getting abused. Forgive yes but get abused again ,no way,they can stay out of my life..
» Jenny has been REAL busy over at PMMS!